Although we may disagree on nearly all points of rankings, players, and NCAA sanctions – one thing about Big 10 Football is distinct– the undying support that each team receives from its Marching Band. No other conference exhibits such quality Marching Bands at each of its schools. These bands appear at every Saturday home game – through the rain, snow, sleet, and hail – to cheer on their teams. Although born, raised, and still a legal resident of Illinois, I am now and forever a Buckeye and am here to tell you a little bit about my experience as a member of The Best Damn Band In The Land (TBDBITL). I am here not to boast about us as an organization, but express an “Attitude of Gratitude” towards the amazing facilities and opportunities that the members of the Ohio State University Marching Band (OSUMB) share. Named for Joan Zieg Steinbrenner, OSU alum and wife of the late George M. Steinbrenner III, the Band Center first opened its doors for the 2001 Band Season, welcoming TBDBITL to the newest and best Band Center in the country. Before this facility opened, the “old band room” was under the Northeast corner of Ohio Stadium, having been forced to move due to massive stadium reconstruction. 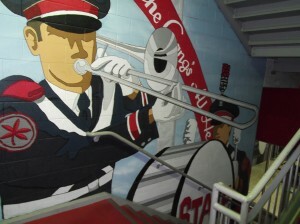 This facility is truly state-of-the-art and houses all components of the Marching and Athletic Bands When first walking into the Band Center, one is greeted by murals spanning the two story staircase that feature all instruments in the band, the Drum Major, and Ohio Stadium, as well as the official crest of the OSUMB, embossed upon the wall. One then reaches the foyer of the Band Center – a horseshoe shaped room filled with display cases documenting the history of the band from its beginnings in 1878 with artifacts, articles and pictures. The ceiling is adorned with the words to the Alma Mater, Carmen Ohio. The first floor of the Band Center features complete office facilities that provide separate offices for the Director and Assistant Director, as well as a shared office for the Percussion Instructor and Graduate Assistant Directors. Four paid student secretaries share the main office, where they copy music, charts, and forms, which are then distributed to each of the 225 members through personalized mailboxes located in the Rehearsal Hall. Passing the lounge and kitchen facilities, the Music and Drill Library is on the right, adjacent to the conference room. Further down the first floor is the Record Fund Office that handles tickets, and sales of souvenirs and memorabilia (also staffed by two paid student employees). Also on this floor are practice rooms that house lockers for each section’s practice and game horns, as well as serving as sites for pre-rehearsal sectionals. Yes, you read that previous sentence correctly: through generous donations and funding from our alumni and sponsor donations, each member of the OSUMB is provided with a “Game” horn, as well as a “Practice” horn – only on a game-day does the complete set of game horns make its way from the lockers, providing a uniformed look that most college bands around the country are unable to able to match. Baritones and Mellophones share a practice room; E-flat Cornets, B-flat Trumpets, Flugelhorns, and Tenor and Bass Trombones share a practice room, Sousaphones have a storage room, and all percussion is housed in a separate storage room. The feature of the first floor though, is the Rehearsal Hall. With room for 350 plus musicians and recording-level acoustics, this Rehearsal Hall is designed for work, but shares aesthetic details making the Hall feel more like a home. One is first drawn to the aerial photograph of Script Ohio that has been printed on canvas hanging across the length of the back wall. In addition to this, portraits of John Phillip Sousa and long-time arranger Richard Heine are featured on the back wall. The “Diamond Ohio” cut into the room’s carpeting is placed at the base of the Director’s Podium – the virtual “Command Center” of this room. With at-hand access to High-Definition aerial video recordings from the practice field, the touchpad computers allow the Directors to stop, pause, and highlight video segments to display to the whole band on the six televisions and two projectors – no one in the band can hide sub-par marching when every move is recorded. Finally, adorning the back wall are portraits of each of the eight Directors of the OSUMB, spanning back to the band’s inception by Gustav Bruder in 1878. The second floor of the Band Center features many of the rooms that oversee many of the “behind-the-scenes” actions of the OSUMB. An Alumni Lounge, Kappa Kappa Psi Office, and Tau Beta Sigma Office help to service their respective organizations. The trainer’s office is located at the corner of the hallway, where our volunteer trainer assists band members with all immediate medical issues, ranging from small cuts and bruises to cases of heat exhaustion. The Audio-Video Office controls the microphones and recording components in the Rehearsal Hall and overlooks the Rehearsal Hall so that the Director is always in visual contact with the two paid staff members who operate the audio-video technology. From this room, recordings are taken to be used at the practice field, and game-day video is streamed to the Rehearsal Hall computers. Continuing further down the second floor, you will pass separate locker rooms for males and females – each member of the OSUMB having use of a locker for his/her uniform parts. One of the busiest rooms in the Band Center though is the Uniform Office. This office is staffed by four paid students who control the inventory and sale of all components of each student’s uniform. In addition to the pieces of uniforms rented at no cost to OSUMB members (wool coat and pants, hat, raincoat, overcoat and crossbelts), the Uniform Office also sells replaceable items (plume, gloves, berets, and spats) and controls the stock and sales of these items. In addition to the rental and sale of items, the staff is also trained to repair and/or personally tailor each of the rented uniform parts. The other of the busiest rooms is the Instrument Office. The job for Instrument Office, staffed by two paid student managers, begins at the beginning of the summer when renting out instruments begins to students who will audition for the band before school starts. Keeping an inventory of the hundreds of school instruments, as well as stocking replacement parts and mouthpieces requires much time devoted outside of the normal required business hours. In a separate room behind the Instrument Office is the Instrument Repair Room where two paid staff repairmen have the tools and parts to tear apart and fix every instrument in the band. Whether soldering a new brace on a Bass Trombone or rolling the dents out of the body of a Sousaphone, these repairmen are trained to handle each instrument that the OSUMB stocks. Just writing this brief article about our Band Center makes me once again aware of how truly fortunate our program is, and as a result how indebted we are to the School of Music and the University as a whole. The running joke this season is that “Because Ohio State doesn’t have a football program this year; we need the band, now, more than ever.” People can joke about this, but Ohio State fans place much of their pride and support in TBDBITL, and we’re only the best partly because we have the best to work with. It’s easy for me to sometimes take for granted what I have as a member of TBDBITL, as each one of us is liable to do from time to time. Upon this brief reflection over the quality facilities I use each and every day, though, I am once again put in awe of how privileged I am to be a member of The Best Damn Band In The Land and use The Best Damn Band Center In The Land. Zacke is entering his Junior year at The Ohio State University, studying Electrical Engineering and plans to continue on to Law School with aspirations of becoming a Patent Lawyer. From Manhattan, Illinois, Zacke plays the Sousaphone in the OSU Marching Band, and will earn the honor of "dotting the 'i'" his Senior Year. He is a member of the Honorary Band Fraternity Kappa Kappa Psi where he is the Head Editor of the Marching Band Yearbook. Zacke is the State Parliamentarian for the Illinois Senior Classical League, in which he helps plan and run the yearly Illinois Junior Classical League State Conventions for High School Students. Zacke is an Eagle Scout and enjoys camping and helping his local Boy Scout Troop where he is an Assistant Scoutmaster.